Downtown Los Angeles is filled with more things to see and do than you might think. In fact, it may even take more than a weekend just to see it all. Plan your Downtown Los Angeles weekend getaway using the resources below. 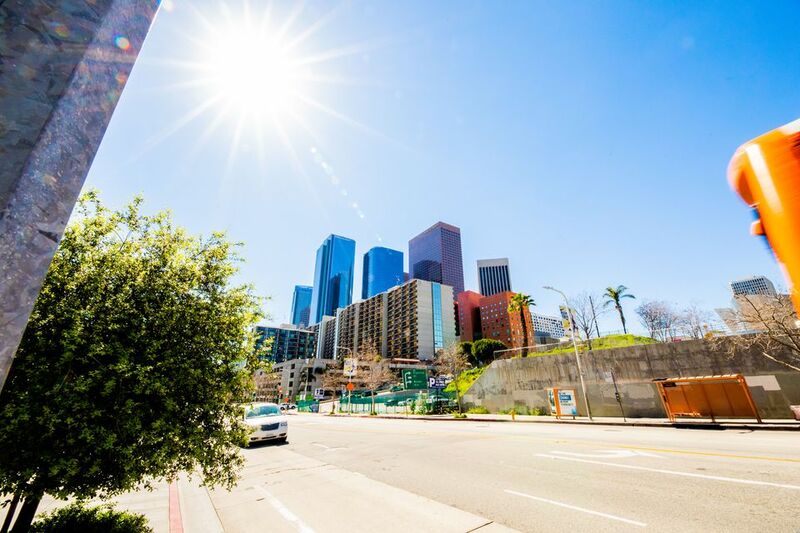 Many Los Angeles visitors overlook downtown Los Angeles, but it offers the best in performing arts, great shopping, good places to eat and a glimpse into Los Angeles history. Downtown Los Angeles can be hot in mid-summer, but otherwise, it's fun almost any time. There are so many movies and other productions going on in downtown these days; it's hard to miss them. So keep your eyes open for closed sidewalks, police escorts and lines of white trucks parked at the curb, all of them sure signs that there's filming going on close by. Take a Self-Guided Walking Tour: You'll get a glimpse of all of the city's 200-plus-year history. Performing Arts: Get tickets for the symphony, Center Theater Group or other downtown performances. If you plan ahead, you may be able to get a discount. Take a Historic Walking Tour: The Los Angeles Conservancy walking tours are a good way to learn more about the city. Shop for Bargains: The Los Angeles Garment District is full of them. So is the Toy District and the Jewelry District. Sports and Concerts: The Staples Center is home to basketball, ice hockey, and indoor football teams, and when none of that is going on, it sometimes becomes a concert arena. The Microsoft Theatre at LA Live also hosts some great performers. Dodger Stadium is also very close to downtown. The Los Angeles Marathon finishes in downtown, causing many street closures. It's held in early March. It's bigger than it looks. Parts of downtown are still grubby and rundown and some streets host a large population of homeless folks. If you're walking and get into an area you're not comfortable with, turn around and get out. On the plus side, you'll see members of the "Purple Patrol" on the streets. Their job is to help keep downtown safe and clean. They're also like roaming concierges, ready to answer questions and provide directions to popular destinations. Leave your car parked and use the DASH bus or Metro to get around. Download useful apps to help you look like a pro. Check out the best apps for your trip to LA. Long-time Los Angeles favorites downtown include Philippe the Original (French dipped sandwiches) and the Grand Central Market, which is evolving into an, even more, fun food destination. You'll find a batch of dining spots at L.A. Live. You'll find plenty of restaurant reviews at Yelp and during Restaurant Week you can sample some of the area's top spots for reduced prices. Downtown Los Angeles is 120 miles north of San Diego, 270 miles west of Las Vegas, 220 miles from Fresno and 380 miles south of San Francisco. Many of the LA metro area freeways will get you there, including US 101, I-110, I-10 and I-5. If you're flying, LAX is the most obvious choice, but Burbank (BUR) is closer and much less congested. By train, Amtrak's Pacific Surfliner Line stops at Union Station in Downtown Los Angeles.